The music on In My Grandfather’s Day represents not only most of the published music of Gerhard Theodore Alexis, but also a number of unpublished compositions. Unless otherwise noted, the selections are either known or believed to have been composed or arranged during Gerhard’s years at First Lutheran Church in St. Paul, Minnesota (1916-27). Organ compositions have been recorded as written, while vocal pieces have been recorded as solos with organ accompaniment. Gerhard’s setting of the well-known text from Psalm 19:14 (ASV) survives as a handwritten arrangement for a cappella four-part women’s voices and was most likely intended for use during services at First Lutheran Church. An a cappella arrangement for male quartet of Psalm 139:23-4 written in Swedish. The singable English verse was arranged by David after Kent Karlsson’s translation and the verses of the psalmist. The handwritten individual parts were set in the key of C. It is recorded in Bb. He also formed a male quartet with colleagues at First Lutheran in the spring of 1927. The four friends had all sung in the Wennerberg Chorus at Augustana College, Rock Island, Illinois. They gave but two concerts prior to his untimely and unexpected death. 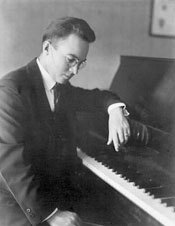 “Utransaka” may have been sung in church or in concert by one of Gerhard’s own quartets or by the men in one of the several ensembles he conducted. Number 569 in the 1925 Augustana Synod Hymnal (Gerhard was a member of the committee who approved, composed and/or arranged the music for the hymnal). Composed in 1924, the tune is entitled “Maria”, after Gerhard’s wife, Olga Maria Grund. Verses 1 and 3 are sung. Text by Matthias Claudius, 1782, after Matthew 13:38. While in Ishpeming, Michigan (1910-11), Gerhard composed music for a Swedish text “Den som beder han skall få” (“He who prays, he shall receive”). The one-verse handwritten setting was discovered on the back of a draft of “Andante”, an original unpublished work for organ written in September 1910. No information on the text, its additional verses, or its author, “S.A.”, has been found as of this writing. Number 627 in the 1925 Augustana Synod Hymnal. The tune, entitled “Seraphim”, was composed in 1923. Verses 1 and 3 are sung. Text by Christopher Wordsworth, 1862, after Revelation 7:14. The instrumental interlude that separates the two sung verses is drawn from an unpublished collection of organ variations for hymn tunes written by Gerhard in 1926. It is apparent that the composer was toying with at least one other text for his tune: a hand-written copy of “Love Divine, All Loves Excelling” (Charles Wesley, 1747) set to “Seraphim” survives among his effects. Number 609 in the 1925 Augustana Synod Hymnal. The tune, entitled “Blessed Hope”, was composed in 1924. Text by Mary Ann Thomson, 1872. An Easter hymn (Påskhymn) for three-part a cappella women’s voices, written in Swedish. The singable English verse was arranged by David after Kent Karlsson’s translation. The composition was most likely sung as the joyful beginning to Easter Sunday services or perhaps as a response following the reading of Scripture. An organ composition dedicated to Mr. J. Frank Frysinger, Gerhard’s organ teacher while at the University of Nebraska in Lincoln (1911-14). It was published in a 1920 collection of instrumental and vocal pieces by Theodore Presser Co., Philadelphia, and described as “a charming and melodious study in registration.” The individual sheet music copy published in 1920 sold for fifty cents. It was played by concert organist Hugo Goodwin on WCCO radio. Gerhard’s four-part setting of the Agnus Dei was composed in 1924 and dedicated the choir of First Lutheran Church. It appears as a communion response (number 681) in the 1925 Augustana Synod Hymnal. It was also published by the Augustana Book Concern of Rockford, Illinois together with J.S. Bach’s “Song of the Pilgrim” and sold for eight cents. Gerhard later arranged his composition for male quartet in G minor, though this setting remains unpublished. The version recorded on In My Grandfather’s Day is the original SATB setting in F minor. Gerhard’s unpublished arrangement of a tune by John A. West. The 1841 text by Jemima T. Luke has been set to at least two other tunes, including the English melody “East Horndon” in the 1925 Augustana Synod Hymnal. As of this writing, no information has been found on Mr. West. The SATB arrangement may have been submitted for hymnal consideration or intended for use in church or concert. An unpublished SATB hymn surviving in handwritten individual part sheets. Gerhard most likely drew the two-verse text from the1921 Svensk Söngdagsskol-Sångbok. Marita Karlisch of the American Swedish Institute also found the text in the 1819 Psalm-boken and Koral-bok as verses 4 and 5 of the hymn “Bort, mitt hjärta, med de tankar” (“Away, my heart, with the thoughts”). Numerous authors contributed to this seven-verse hymn, though it is unclear who authored the individual stanzas. Number 615 in the Augustana Synod Hymnal. Both the text and tune (“Daystar”) were written by Samuel Martin Miller in 1922. Gerhard provided the harmonization in 1925. Verses 1, 2 and 4 are sung. Reverend Miller was a pastor in the Augustana Synod, the Dean of the Lutheran Bible Institute in St. Paul, and has several other texts and tunes in the 1925 Hymnal. One of Gerhard’s best known organ works. Along with “Andante Pastorale”, it was heard on WCCO radio. Composed in 1921 and published by Gamble Hinged Music Co., Chicago in 1926, it is dedicated “to my mother.” Though not included on In My Grandfather’s Day, Gerhard also wrote optional parts for violin and cello. Gerhard’s unpublished through-composed setting of the well-known text by Augustus M. Toplady, 1776. The composition was written for solo voice and choir with organ accompaniment. Number 485 in the 1925 Augustana Synod Hymnal. The tune, composed in 1924, is entitled “Ingrid”, the name of Gerhard’s mother. Verses 1 and 4 are sung. Text by Gerhard Tersteegen, 1729. “Ingrid” also appears as number 391 (first tune) in the Red Hymnal, albeit transposed to the key of F from its original G. The tune is here entitled “St. Ingrid”, leading one to speculate that the organizers of this hymnal believed it to have been inspired by the 13th century Swedish nun. Ingrid was the first Dominican nun in Sweden and she founded the country’s first Dominican cloister. It appears however that she was never canonized by the church. Subsequently, she is sometimes referred to, rather than “Saint Ingrid”, as “Ingrid of Sweden”. This may account for the discrepancy among the hymnals. Her cloister and relics were destroyed during the Reformation. A piece for a cappella male quartet surviving in handwritten form. The sole credit, “A. Jahnke”, is in the upper right-hand corner of the page (indicating the name of the composer.) As of this writing, no information has been found on Jahnke or on the source of the text. The handwriting and style strongly suggest arrangement by Gerhard. On In My Grandfather’s Day, it is recorded in the key of G, transposed from the written Ab. While two verses exist, only the first is sung (following an instrumental reading of the music). The piece may well have been arranged for and sung by the quartet to which Gerhard belonged at the time of his death. An unpublished organ composition dedicated “to my brother, Carl Alexis.” Though no date of composition is listed, the work bears the address on Minnehaha Avenue in St. Paul where Gerhard and his family lived between 1917 and 1925. Three handwritten copies survive among his effects. “The School House Stands by the Flag”, also entitled “Flag Song”, with a text by H. Butterworth (no information has been found on this writer). It was set in the key of B and dated January 8, 1910, at which time Gerhard was studying organ at Augustana College, Rock Island, Illinois. “Our Flag Over There” with a text by Gerhard’s sister-in-law Hedvig Grund Hammann. While the date of this setting in Bb is unknown, the more mature handwriting style as well as the use of “Presser Philadelphia” (publishers of “Andante Pastorale”) sheet music indicate the years at First Lutheran. Heddie’s patriotic text may have been informed by her service as a nurse overseas during WWI. View an excerpt of her journal. The Swedish text recorded on In My Grandfather’s Day was set in the key of C (though it is recorded in Bb) and may have been arranged for one of Gerhard’s quartets or male choruses during his years at First Lutheran. The setting survives in handwritten part sheets – first and second tenor on one sheet, first and second bass on another. The source of the text remains unknown. Gerhard’s original setting of Lina Sandell-Berg’s text survives as a handwritten copy simply entitled “Hymn”, and may stem from his year studying abroad in Stockholm (1914-15). One verse of Swedish text is sung, followed by David’s singable English verse, arranged from Kent Karlsson’s translation. Slight adjustments to the music and text have been made, including a transposition to the key of Eb from the original Db. Number 557 in the 1925 Augustana Synod Hymnal. The tune, entitled “Ishpeming”, was composed in 1924. It is a tribute to Gerhard’s time in that Michigan town during 1910-11 where he served as organist at Bethany Church, and where he met his wife-to-be Olga Maria Grund. Text by Johann Friedrich Herzog, 1670, and Johan Olof Wallin, 1816. David adjusted the final line of text for the 1996 funeral of his cousin, Gerhard’s grandson, Paul Wolff (from “Grant that I rest secure in Thee whether I live or die” to “Then may I rest secure in Thee and live with Thee on high”). In My Grandfather’s Day preserves that tribute. “Ishpeming” also appears as the wedding hymn “Lord, Who at Cana’s Wedding Feast” in the Red Hymnal (number 301), with a text by Adelaide Thrupp, 1853, and Godfrey Thring (1823-1903). A response included as number 680 in the 1925 Augustana Synod Hymnal. Text by Claus August Wendell, 1924. Music arranged by Gerhard from the well-known French composer Charles Francois Gounod (1818-1893).